President Tran Dai Quang and Governor-General of Australia Peter Cosgrove have agreed to strengthen political and strategic trust between the two countries by enhancing the exchange of visits and meetings. 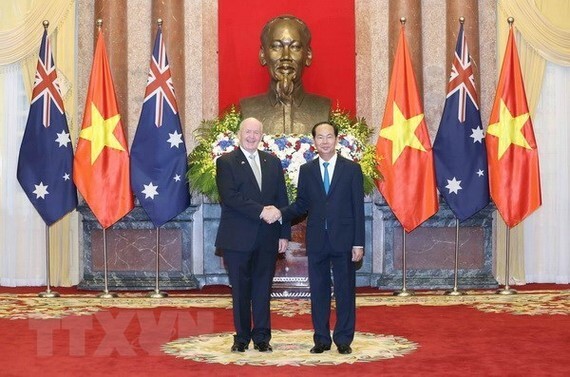 They reached the consensus at their talks in Hanoi on May 24, which was held immediately after the official welcome ceremony for the Australian guest, who started his State visit to Vietnam, the first official one as Governor-General of Australia, on May 23. President Quang highlighted the significance of the Governor-General’s visit, expressing his belief that it will contribute greatly to promoting the Vietnam-Australia strategic partnership. The Australian leader congratulated Vietnam on its important achievements in the nation-construction and development cause, as well as its increasing role and position in the region and the world. He affirmed Australia always attaches importance to the friendship with Vietnam and hopes to further deepen the newly-established strategic partnership. The leaders expressed their joy at the strong and effective development of Vietnam-Australia relations in recent times, saying that the regular exchange of high-ranking delegations at all levels reflected the two sides’ respect for the reinforcement of their political trust and mutual understanding. They assessed that the two countries have reaped encouraging outcomes in their economic ties. The countries’ two-way trade value hit nearly 6.5 billion USD in 2017. Australia has poured 1.8 billion USD in 400 projects in Vietnam, ranking 19th out of 129 countries and territories investing in the country. They agreed to continue organising activities to celebrate the 45th anniversary of diplomatic ties, thus raising public awareness of the bilateral relations. The leaders stressed the need to improve the efficiency of existing bilateral cooperation mechanisms, and promote newly-formed cooperation mechanisms such as Economic partnership, Innovation partnership, Agriculture partnership, and the meeting of Foreign Ministers. The two sides should make more efforts to push pillar cooperation fields such as security-defence; economy-trade; science-technology; education-training; and development aid, towards expanding their collaboration in other potential domains, they said. President Quang suggested the two sides seriously take into account trade barriers, which can affect their key exports; and devise policies encouraging Vietnamese and Australian enterprises to increase investment in the fields of Australia’s strength and Vietnam’s demand, including energy, infrastructure, telecommunication, finance-banking, mining, manufacturing, hi-tech agriculture, education and tourism. The Governor-General affirmed Australia will continue to promote security-defence links with Vietnam, focusing on training, and joining the UN peacekeeping force, adding that his country will also actively support Vietnam in solving post-war UXO consequences. The country will also provide Vietnam with information related to missing Vietnamese officers in the spirit of the Memorandum of Understanding signed between the two sides in 2015, he added. 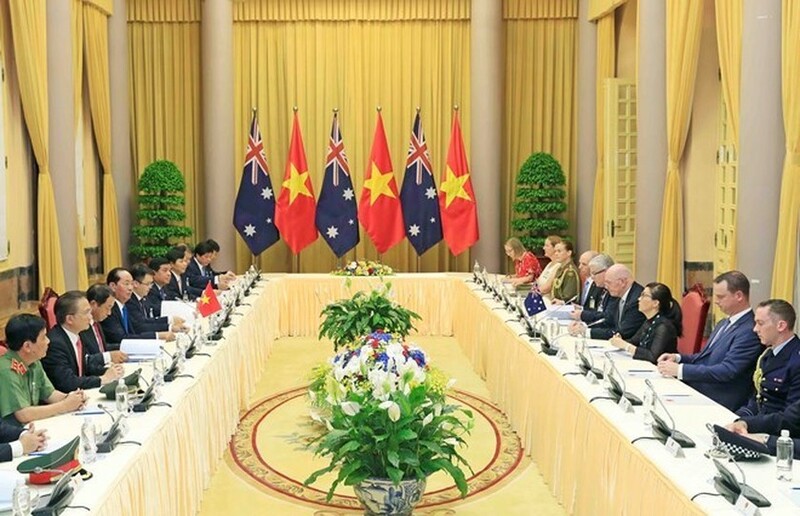 President Quang thanked the Australian side for continuing to give Vietnam a priority in its official development assistance (ODA) provision, affirming that Australia-funded development projects have been implemented effectively in Vietnam. After the construction of My Thuan bridge, Cao Lanh bridge built with Australian funding in the Mekong Delta region will be put into use on May 27, marking itself as a vivid symbol of Vietnam-Australia friendship, he stressed. The leaders also highlighted the potential for the two countries to expand their collaboration in education-training, culture exchange, tourism, labour and sports, saying that these can directly help enhance the friendship between the two sides. President Quang noted a sharp increase in the number of Vietnamese coming to study in Australia, which has reached nearly 30,000 presently. He mentioned the fact that around 1,000 Australians visited Vietnam under exchange programmes and the New Colombo Plan. Meanwhile, the Australian leader showed his impression at the number of 400,000 Australians visiting Vietnam in 2017. They agreed to make it easy for the two countries’ airline firms to open more direct flights connecting their big cities, and encourage their citizens to join the Vietnam-Australia Work and Holiday programme. During their talks, the leaders also compared notes on regional and international issues of common concern. They also affirmed mutual support at regional and international forums, especially the UN, ASEAN, and cooperation mechanisms led by ASEAN; consistent stance in East Sea-related issues; and close cooperation in implementing the freshly-signed Comprehensive and Progressive Agreement for Trans-Pacific Partnership (CPTPP). The Australian leader invited President Quang to visit Australia in a convenient time.